TWO Yorkshire One matches dominate the local rugby union scene tomorrow with Old Rishworthians hosting Heath and Old Brodleians facing Old Crossleyans (2.15). There will be much more than local rivalry at stake at Copley, where Rishworthians are in a relegation battle with their problems increased by last weekend’s narrow defeat away to fellow strugglers Hullensians. Heath, in contrast, are looking to nail down promotion after going close last season and they gave their prospects a shot in the arm with a hard-fought win at home to another of the contenders, Pontefract, last Saturday. 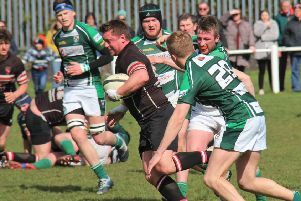 Rishworthians team manager Dan Ingham said: “Heath are looking for promotion and with their very strong pack we can expect them to play it in their forwards. Rishworthians will be without Doug Heseltine, who is playing for Edinburgh in the Rugby League Challenge Cup. Top try scorer Anthony Shoesmith and young forward James McHugh are also unavailable. Heath coach Dave Harrison will be hoping for a more fluent display and improvement in the lineout as his side look to complete a double after their 34-7 home win in October. Eddie Cartwright is unavailable so Jack Crabtree reverts to full back with Michael Reynolds in at scrum half. Newcomer Alex Patrick starts at lock, after coming off the bench last week, alongside Matt Beasty. There is sure to be a large crowd at Hipperholme as more than 150 will attend a pre-match lunch. Crocs are third in the table and Brods are seventh so the visitors will be favourites. However, Brods will be keen to make home advantage tell and avenge an 18-13 defeat at Standeven House earlier in the season. The Hipperholme boys have recovered from a shaky December with two good recent wins and the visitors will have been pleased with their 41-0 home win over Selby last Saturday. Brods should have players back. Rob Jennings had a bout of food poisoning last Saturday and Harris Morris was representing Lancashire Colts. Michael Briggs was away for the weekend but Callum Thompson continues to be unavailable following his recent red card at Heath. Crocs spokesman Howard Cooper said: “It’s always a test at the Brods and they appear to be performing well at the moment. Callum Dunne returns and Crocs hope that Mark Boothroyd will be available. Halifax Vandals are at home to Yorkshire Two’s bottom club Leeds Modernians tomorrow. Vandals lost 28-17 at Castleford last Saturday while Mods were running leaders Wensleydale close, going down 20-17.